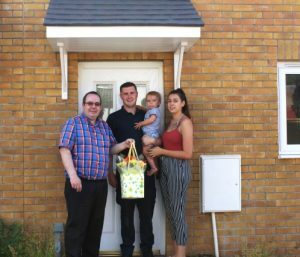 This week we’ve welcomed aspiring homebuyers and our very first Rent to Own family to their newly built two bedroom home in East Cardiff. Earlier this year the Welsh Government launched their Rent to Own scheme which allows buyers in Wales to build up a lump sum towards a deposit while they rent their home. The deposit can then be used against the purchase of the home. Buyers will initially rent the home and can receive 25% of the rent paid over the duration of the tenancy and 50% of the increase in the property value (if any) during the period of time they have rented the property to use as a deposit towards purchasing the property. The Rent to Own – Wales agreement lasts up to five years, applications can be made at anytime between the end of the second year and the end of the agreement to purchase the property. We currently have three 2 bedroom properties available in East Cardiff. If you’re interested in applying please contact us by emailing rent-to-own@hafod.org.uk. You can find further information about Rent to Own – Wales and check if you’re eligible by visiting the Welsh Government’s website www.gov.wales/Yourhomeinwales.